The DustEater® Air Filter series is proven in independent laboratory testing to provide highly efficient system-wide air filtration with low resistance to airflow. Utilizing two electrostatically charged fabric panels separated by our unique ACCUMULATOR CHAMBER® produces a very effective three-stage filtration process. The first media panel (prefilter) attracts and holds airborne particulates. 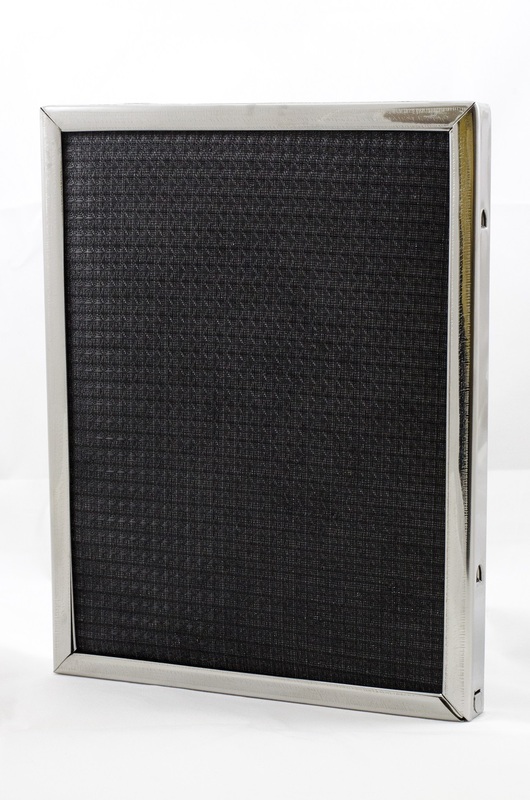 The filter fabric's inherent electrostatic charge enhances filtration by drawing particulates onto fiber surfaces like iron fillings onto a magnet. Static electricity, being static, does not flow like electrical current, and therefore does not discharge over time or require either grounding or insulation. When particulates build up on the prefilter, airflow causes them to break off and be swept into the ACCUMULATOR CHAMBER, where turbulence and electrostatic forces cause agglomeration into even larger particulates. These agglomerated particulates are too large to pass through the second panel (afterfilter). The afterfilter attracts and holds the smaller particulates that may have escaped the prefilter, or do not respond to an electrostatic charge. The DustEater Easy Flow (Model EF), low resistance to air flow air filter, contains polypropylene and wire reinforced in a stainless steel frame. The Easy Flow model is ideal for heat pumps, sensitive 90+ furnaces and older systems with limited air flow.